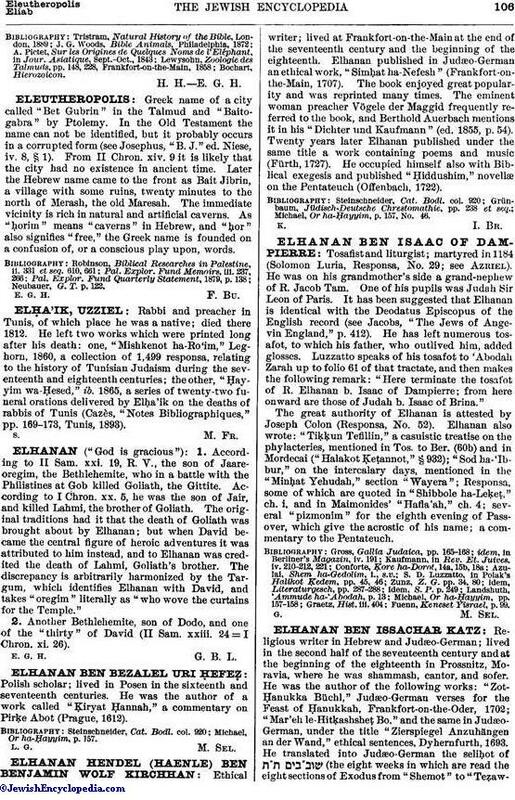 Greek name of a city called "Bet Gubrin" in the Talmud and "Baitogabra" by Ptolemy. In the Old Testament the name can not be identified, but it probably occurs in a corrupted form (see Josephus, "B. J." ed. Niese, iv. 8, § 1). From II Chron. xiv. 9 it is likely that the city had no existence in ancient time. Later the Hebrew name came to the front as Bait Jibrin, a village with some ruins, twenty minutes to the north of Merash, the old Maresah. The immediate vicinity is rich in natural and artificial caverns. As "ḥorim" means "caverns" in Hebrew, and "ḥor" also signifies "free," the Greek name is founded on a confusion of, or a conscious play upon, words. Neubauer, G. T. p. 122.